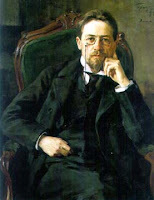 As a late celebration of Anton Chekhov’s 150th birthday, which was January 29, today I reread “Пари” (“The Bet”), a very short story that I enjoyed in sixth grade. I think it must have been the first piece of Russian literature that I ever read… if I don’t count my beloved Baba Yaga tales. The bet in “The Bet” originates with a conversation about capital punishment and imprisonment. The bet involves one man volunteering (with the hope of a fat payoff) for a long stretch of solitary confinement. The end gave our teacher a perfect chance to explain irony, though I seem to recall that “a priori” was far more problematic. The wonder of Chekhov is that “The Bet” was simple enough to discuss in sixth grade but doesn’t feel simplistic all these years later. I’d love to hear readers’ Chekhov recommendations. “Дама с собачкой” (“The Lady with the Little Dog”) and Палата No. 6 (Ward No. 6) are two of my old favorites. I never seem to read enough Chekhov, but I’m hoping to get to some new novellas – Степь (The Steppe) and Дуэль (The Duel) – this year. On a more contemporary note, Elena Eltang won the first-ever NOSE Award for her novel Каменные клены (The Stone Maples). I’m not sure, but I think this must be the only Russian novel that includes a bed and breakfast in the Welsh moors. Winner of the readers’ award was Vladimir Sorokin’s Сахарный Кремль (Sugar Kremlin). I listed the award finalists in this previous post and wrote about the award itself here. The NOSE award winner were determined through open debate with prize finalists present. How far can testosterone propel a work of fiction? Yes, the fact that I’m asking that question means I think Sergei Samsonov’s Кислородный предел (The Oxygen Limit) is about testosterone. And survival of the fittest and beauty and perfection and attraction and the fear of death. There are even mentions of DNA and nucleotides. I’ve never counted, but I don’t believe I’ve ever read a book with so many uses of the words самец and самка – basically, male and female examples of a species – to refer to humans, though Tolstoy uses самка quite memorably at the end of War and Peace, describing Natasha Rostova. Samsonov, a writer of around 30 who should not be confused with the Sergei Samsonov who’s a left wing for the Carolina Hurricanes, has compiled an intriguing and energetic but messy and unsatisfying novel about a fire in a hotel and the aftermath for several survivors. They go on a carnivalesque rampage in my favorite passages of the book, celebrating their symbolic rebirth. They then begin searching for a woman, Zoya, who was also in the hotel. One character, businessman Sergei Sukhozhilov (name root: sinew, tendon), left her in a bathtub filled with water before he fell out a window. Water and fire and oxygen all hint at primal themes that fit with Samsonov’s focus on biological survival and continuation of the species. Sukhozhilov’s competition for the ideal Zoya includes the plastic surgeon Nagibin (root: bend), a world-class specialist in allegedly making people more attractive to potential mates. Sukhozhilov and Nagibin have already had a testy meeting playing soccer: competition and survival in The Oxygen Limit carry over to sports and business. The cast even includes an oligarch. The Oxygen Limit’s biological and social messages are universal and important, but Samsonov’s execution often failed me. Suffocating me with reminders of his message was one problem. An easy example to cite: what I see as his overuse of самец. This may sound horribly picky, but did he think we couldn’t figure that out from the characters’ behavior and talk about biology? And I know collecting status stuff is common behavior for a certain type of самец, but I can’t disagree with critic Dmitry Bykov’s assertion that Samsonov should cut back on his descriptions of brand-name clothes and cars. Perhaps the biggest problem with The Oxygen Limit is revealed, inadvertently, at the end of the text, on page 414. “Июль 2008 – апрель 2009” (July 2008 – April 2009). Four hundred pages in just ten months? Critic Lev Danilkin, despite praising the book far more than I ever could, suggests Samsonov has graphomania and wrote the book, with all its undigested material (amen! ), in one sitting. There’s lots, lots more I could add from Bykov and Danilkin but I don’t think it’s worth hyperventilating over The Oxygen Limit. Yes, Samsonov says a lot about human nature, and his writing shows tremendous skill, drive, and promise, but I also feel a disconcerting imbalance that tilts away from discipline. I don’t mean to sound like a scold, but a few months of rewriting might have converted all this energetic but raw material into something far more memorable. Ah, the letters Ж (Zh) and З (Z)! I decided to combine them since they do fall one right after the other in the alphabet and I’ve read so little by writers with Zh and Z names. 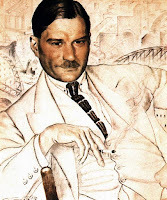 I only have one real, true Z-rooted favorite: Evgenii Zamiatin (Yevgeny Zamyatin). And that’s thanks to one book, Мы (We), which I haven’t read in years, and a few stories, particularly “Пещера” (“The Cave”). I read We several times in translation during my college years, when I was fixated on dystopias and still hadn’t forgotten math. I should reread it, in Russian this time, and move on to some of Zamiatin’s other works, like Уездное (A Provincial Tale) and Островитяне (Islanders). Beyond Zamiatin, I just don’t have much Ж or З experience. I always enjoy Mikhail Zoshchenko when I pick up his stories because I love his humor… but I never seem to read much because of my overwhelming preference for long stories and novels. It doesn’t help that my Zoshchenko books love to cultivate mildew. Fungus can be a positive, though: I liked Zinovy Zinik’s The Mushroom Picker (evidently known as Русофобка и фунгофил in Russian), which includes ample servings of food and laugh-out-loud humor. I read the book in translation some years ago but haven’t sought out more Zinik. I should. I’m even worse off with Zh/Z poetry. I have faint memories of reading Vasilii Zhukovskii (Vasily Zhukovsky), whom Mirsky’s History of Russian Literature calls “the first pioneer and the accepted patriarch of the Golden Age.” And then there’s 20th-century poet Nikolai Zabolotskii, pretty much terra incognita, though on my shelf. A Z-Related Note. Probably the easiest place to look for more of Zinik’s work is a Russian literary journal with a name beginning in З: Знамя (Znamia for “banner”). Znamia offers lots of Zinik on this page, and recent issues of the journal have published fiction by German Sadulaev, Aleksandr Snegirev, Yury Buida, and Leonid Zorin. Maybe I should start with Zorin, since his name begins with Z and Znamia has published a lot of his work. Znamia also makes annual literary awards. The Z-List for Future Reading: Beyond getting caught up on my Zamiatin and finding more Zinik, I want to give Vladimir Zhabotinskii’s (Jabotinsky) Пятеро (The Five) another try after setting it aside a few years ago. I learned about the novel from The New Republic, which published this positive review of Michael Katz’s translation in 2005. Ideas for more Zh and Z reading are, as always, very welcome. I’d be particularly curious to hear thoughts on Aleksandr Zinov’ev (Alexander Zinoviev), whom I’ve never read. How does Slavnikova fuse a clutch of loosely connected plot lines about people in the illegal gem industry into a coherent philosophical novel? That’s more mysterious to me than the formation of the veins of corundum – known as rubies if red – that 2017’s people pillage in the wilderness. 2017’s main character is Krylov, a gem cutter who goes to the train station to bring a sweater to his mentor, a professor and illegal gem hunter who’s about to embark on a ruby expedition. Krylov meets an enigmatic woman at the train station. 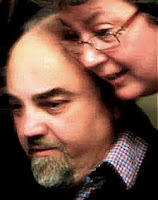 Trysts ensue: they use assumed names (Ivan and Tanya), don’t exchange contact information, and often rent a room. I’ll be honest: the lengthy portion of the book that presents Ivan and Tanya barely held my interest. There’s not enough dialogue for my (picky) taste, and the characters, their situations, and their portrayal didn’t touch me much, emotionally, intellectually, or otherwise. These passages were also so dense and laden with description and metaphors, some of which felt contrived, that I had to read many more than once to feel I wasn’t missing anything important. I know that part of my problem was adjusting to Slavnikova’s style and vocabulary after simpler books but Russian readers and reviewers have also mentioned 2017’s difficult language. Fortunately, I couldn’t abandon the book: 2017 is coming out in English translation in March (Marian Schwartz’s translation, Overlook Press). [Edit/Clarification: I have not seen the translation.] After about 100 pages, I decided that Slavnikova’s metaphors serve a practical purpose: they veil reality, adding a formal way for her to convey her messages about opacity, translucence, and what exists. Slavnikova also loads in lots of recurring symbols. Beyond the stones, some of which are as malformed as the people who find them, the book is filled with glass and mirrors. Tanya wants to go through the looking glass, and Krylov’s loving ex-wife Tamara, a high-end undertaker who holds lotteries for grieving families, has a conference room equipped with a mirrored table. Tamara also appears on a talk show that’s filmed in a studio with a mirrored floor. She brings caskets. Slavnikova works in endless contrasts between reality and invention, too: real and synthetic gems, plastic surgery, holograms, a nonexistent city, liars, and other types of pretenders. Meanwhile, Russia is getting ready to celebrate the centenary of the 1917 revolution, and people begin dressing in white and red army uniforms, creating fake revolution that results in real deaths. Slavnikova also tosses in references to Pavel Bazhov’s Urals folk stories, which tell of mountain spirits that accompany miners. Those references made the magic and apparitions in the book feel rooted rather than fanciful. All of which is to say that I recommend 2017, despite my initial difficulty engaging with it. Slavnikova’s expedition scenes, carnivalesque episodes, and the portrayals of reality and aloneness made 2017 more than worth the time and effort. 2017 became a book that I can feel better than I can explain, particularly the lonely ending, which I found oddly lovely thanks to its mention of fate.